Camomiles, lilies, roses, tulips, flowers give usHigh spirits, they make you enjoy life, create, fall in love, breathe. But unfortunately, the buds are very short-lived: over time they fade. What if you want to admire the merry daisies all year round and 12 months a year to see "Friends of nature"? It turns out that you can, with your own hands do Flowers from pasta. You can ask how to make boxes with flowers and pasta with your own hands? Now tell! With the help of elongated pasta we makeLeaves, planting them on the glue of a thermo-pistol. Then, from 6 round products we collect a flower: one macaroni is the core, the rest - petals. You will get a magnificent five-petalled daisy. And in order to glue all the details, you need a thermo gun. We take a three-wire wire and glue to itOur leaflets. After that you will need to paint them with a green aerosol. Here there is one secret: to make the leaves and petals come out neat, you need to remove the hot-melt threads with a brush, and only after that you can start painting "Little detail". Next, you need to attach "bud"To a stalk made of thick wire. Do this with the same gun with glue. In the same way, collect a few more chamomiles so that they can be folded into a bouquet. At the very end of our process: cover a small box with figured flour products, and paint the structure with an aerosol "For gold". For this you can use a variety of types of pasta. From what form of flour product you take, will depend on how the box-vase will look like. As you understand, decorated with a pasta boxCan be turned either into a vase and put into it the daisies made by one's own hands, or simply present to the friend or acquaintances the original capacity. 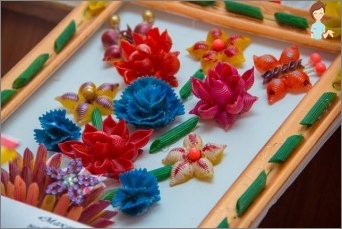 Box with flowers and pasta, made byHands, can be decorated with cornflowers. To make such buds you will need macaroni-bows. Split them into two parts with the help of nippers and glue, forming a flower. And the center of the bud will serve as a millet-colored millet. Then our cornflowers should be attached toStems manufactured using the same technology, as mentioned above. Stems should have leaves that you can make with the help of all the same macaroons. By the way, if we talk about a box for cornflowers, toIt can be attached with a thermo-pistol cord of silk, laying out of it an ornament. In the bends of the tape, you can build figured macaroons, and then, with a paint tape, remove excess adhesive. The capsule should be painted with enamel in brownish or silver colors or with gold. Flowers from pasta, which you can make with your own hands - just a great gift for any fashionable girl. After all, from buds you can collect "Flower beads", And the young lady will go"flaunt"In them on the playground, to brag to her friends. 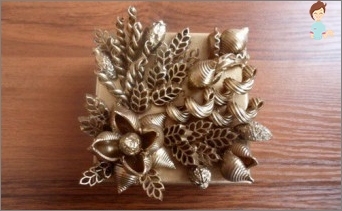 And the girl herself will be very interested in creating buds from "Flour products », Folding them into a decorated box. Such a souvenir will be "A star of tea drinkingAmong the Barbie dolls! Do you know what a topiary is? 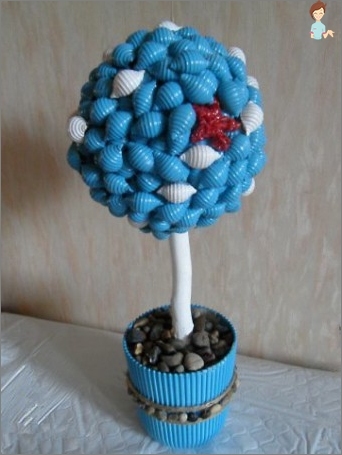 It is a decorative ball with decorations, standing on a stick in a pot. Do you want to make the same from flour products? Artificial flowers, or plastic spoons. Roll a tight ball out of newspaper sheets andWrap it with threads so that the structure does not fall apart. Then it should be smeared with satin ribbons with a stick of glue, put a ball on it, and put the other end in the gypsum that you place in the pot. Thus, you should have the basis of topiary, consisting of a ball on a stick, standing in a pot. Then take the pasta and cover them with the whole sphere. Moreover, on the size of the "Noodles"You will take, and depending on what form it will be, the appearance of the topiary depends directly. Using an aerosol, paint the ball (the color of the nebulizer can be, again, the most different). Well, the final chord of our composition: Decoration of her flowers. You can make them from macaroni according to the techniques described above. When all the components are assembled and glued, the composition will be finished. Agree, a decorative topiary with buds fromPasta, no doubt, will decorate your home. In addition, such a present will not be a shame to present not only to friends, but also to the boss at work, colleagues or just acquaintances. And what is on it Flowers are made Namely from macaroni. Very few people will guess: so gracefully and beautifully they will look. We hope that our advice will benefit yourCreativity, and you will learn how to create real works of art with the help of the most ordinary and simple pasta. And also such techniques will have a beneficial effect on the development of motor skills in children, on the upbringing in them of such quality as patience, accuracy and perseverance. In other words, in pasta colors - only one benefit.